Home Adware Removal What is WebDiscover? Is it safe or should I remove it? Many users are fooled by the marketing pitch of WebDiscover that ‘it’s a convenient tool to search web’, but later they find that it’s a malicious browser. If you are one such user, then you have reached the right place as this removal guide describes in simple steps the most effective ways how to remove WebDiscover permanently from your computer. A. WebDiscover is an adware program. This program infects Internet Explorer, Mozilla Firefox, Google Chrome and other popular browsers installed on your computer. Once installed this adware starts displaying numerous advertisements the moment you start browsing the web. This is a frustrating experience, but it can be easily avoided once you delete WebDiscover infection from your computer by following the removal methods explained below. Q. How Web Discover came into your computer? A. Although this adware has a website, but it must have gotten onto your computer while you were installing a third party program which was bundled with this infection. Next, you would have found your search page is displaying useless search results only to generate ad revenue. Now, the way forward should be to uninstall WebDiscover infection from your computer by using our techniques and then you can restore your original web surfing experience. Q. Why complete removal of WebDiscover necessary? A. Changes made on your computer by this infection are so many that unless you remove this adware in a complete way you are taking a risk of its reappearance after some time. For this reason, our removal methods will help you to get rid of WebDiscover infection from your computer, permanently and completely. Q. What are symptoms of Web Discover infection? A. These signs commonly signify the presence of this adware: You are constantly redirected to ecommerce websites. Ads are destroying your web surfing experience. New Tab function of your browser is opening an unwanted website. Q. How to stop Web Discover from infecting your computer? A. In the future, you must take these precautions to stop the entry of such infections. Pay close attention to the security credentials of a freeware before starting its installation. When installing a software, choose Custom or Advanced mode and opt-out off all options you don’t understand. Make sure you scan your computer with an antivirus and an anti-malware program. Q: How to remove WebDiscover? Method 1: Manual Removal Guideline. Step 1: Uninstall webdiscover from the control panel. Step 2: Remove webdiscover from browsers (IE, Chrome, Firefox). Step 3: Remove webdiscover from browser’s shortcuts. Step 4: Remove webdiscover registry entries from Windows Registry. Step 5: Remove webdiscover from computer startup. Method 2: Automatic Removal Guideline. Step 1: Remove webdiscover adware using AdwCleaner. Step 2: Remove webdiscover browser hijacker using Junkware Removal Tool. Step 3: Remove webdiscover virus using Hitman-Pro Anti-Malware. Step 4: Remove webdiscover malware using Malwarebytes Anti-Malware. Method 1: Follow the steps to remove webdiscover manually. Uninstall webdiscover browser hijacker from control panel which you have accidentally got installed recently. Uninstall recently installed unwanted & unknown programs as well. 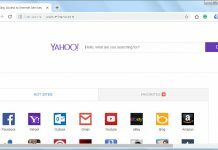 STEP 2: Remove webdiscover browser hijacker from browsers. 1) Remove web discover homepage from Internet Explorer. Remove webdiscover homepage from there and set your homepage URL (Website address) as you want at startup. 2) Remove webdiscover extension from Internet Explorer. In the right-side pane, right-click on webdiscover extension and click on disable or remove also disable all the unwanted extensions from there. 3) Remove webdiscover search engine from Internet Explorer. Now remove webdiscover extension from there and also remove all the unwanted add-ons. 1) Remove webdiscover homepage from Mozilla Firefox. 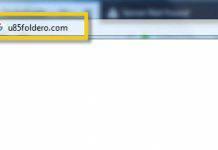 Remove webdiscover URL from the homepage field and type the website address as you want. 2) Remove webdiscover add-ons from Mozilla Firefox. In the right-side pane, select the webdiscover extension and click on remove or disable option. Remove all the other unwanted add-ons from there as well. 3) Remove web discover search engine from Mozilla Firefox. Go to “One-Click Search Engines” section on the same page, select and remove webdiscover from there. 1) Remove webdiscover homepage from Google Chrome. Go to “On start-up” section of the settings page. Remove webdiscover URL from there and add a website address as you want to open at chrom’s startup. 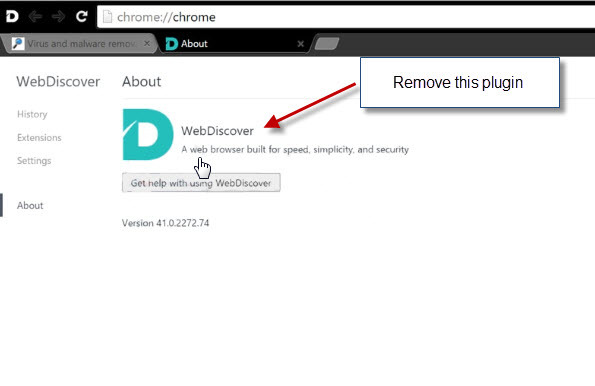 2) Remove webdiscover extension from Google Chrome. Remove webdiscover extension from there. 3) Remove webdiscover search engine from Google Chrome. 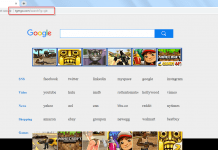 Remove webdiscover search engine from there. STEP 3: Remove webdiscover infection from Browser’s shortcuts. Right click on the icon of Internet Explorer on the desktop then select Properties option, you’ll get a small window, In that window, look on the target field, if you found “webdiscover” string in this target field, please remove all the complete URL related to the webdiscover. Type webdiscover into find box, and click on Find Next button. if it found an entry with the webdiscover name in the result, so please replace all them to Google, or you may remove them if you saw suspicious. STEP 5: Remove webdiscover suspicious entries from computer startup. Click on Services Tab, and un-check all the webdiscover entries. Click on Startup Tab, and un-check all the webdiscover entries. Method 2: Follow the steps to remove webdiscover automatically. STEP 1: Remove webdiscover Adware registry entries using “AdwCleaner” (Free). After reboot, you will be got rid of the webdiscover from your computer. STEP 2: Remove web discover browser hijacker using Junkware Removal Tool (Free). After reboot, you’ll get removed webdiscover from your computer completely. STEP 3: Remove webdiscover virus using Hitman-Pro Anti-Malware (Free for 30days). STEP 4: Remove webdiscover Infection using Malwarebytes Anti-Malware (Free for 30 days).